A new thrill awaits numerous Chucagoland listeners today with the normal opening by W-G-N of a sister station, W59C. This new frequency modulation (FM) station, which has been sending out test program for several weeks, today begins full program operations. W59C was the object of a special salute by W-G-N last evening. 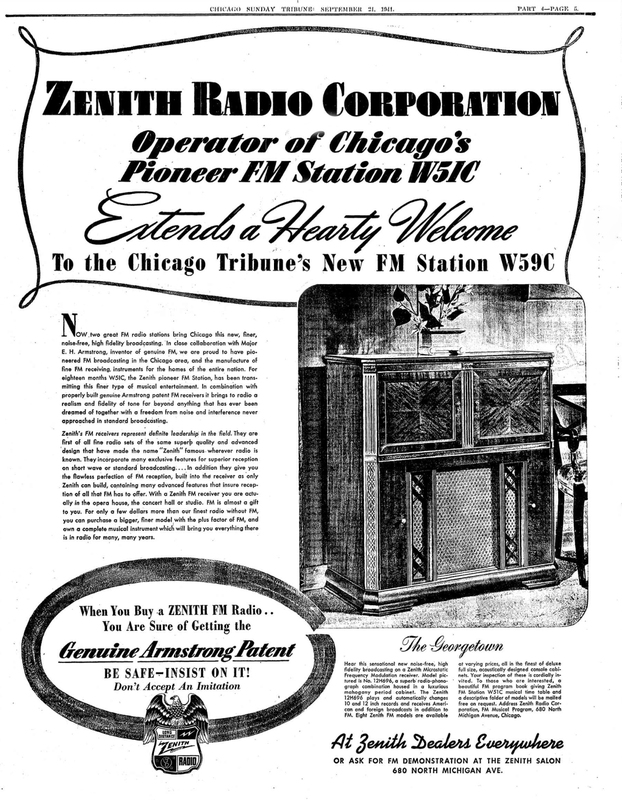 A welcome to the new station was sent out over the Mutual Broadcasting system during the regular Chicagoland Hour. W59C will make its bow at noon and continue operation day from 12 until midnight with a wealth of new radio entertainment and In- formation. All FM stations have special advantages. Thru a newly developed broadcasting technique, known as frequency modulation, they are capable of broadcasting speech and music naturally and of reducing static and man-made interference to a negligible minimum. 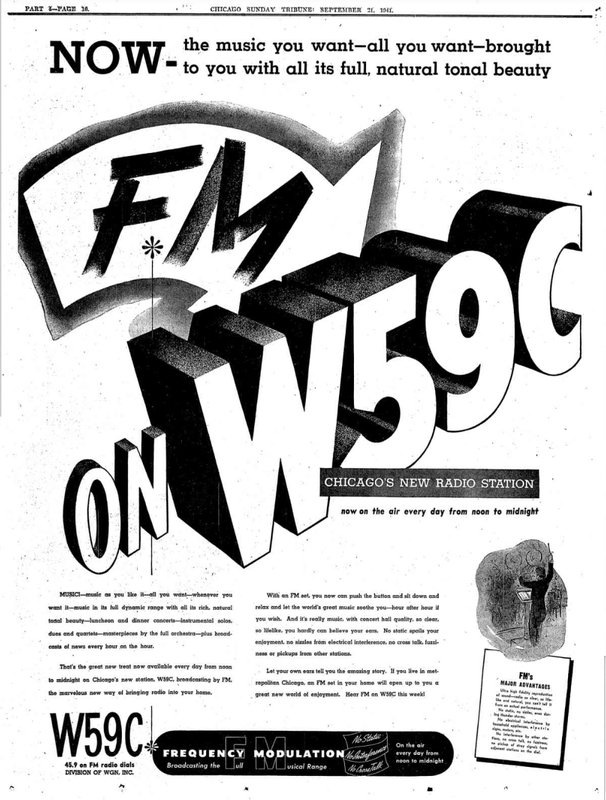 To hear WV59C or W51C, the only other FM station in Chicago, it is necessary to have either a new kind of radio or an attachment for standard type radios. (This subject Is treated more fully elsewhere on the page.) 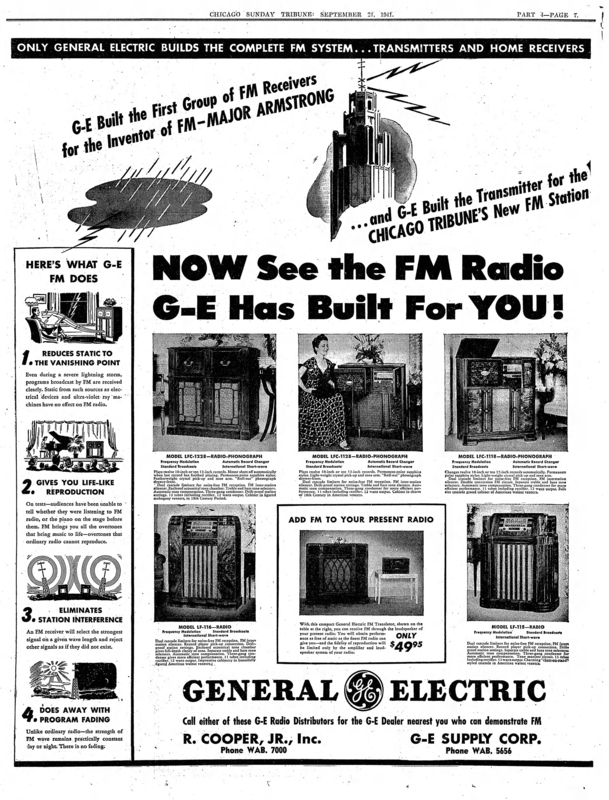 Some 5,000 receivers capable of receiving FM have been distributed round about Chicago. Thus, an audience of perhaps 25,000 persons already has sampled the marvels of this new kind of radio fare. Their response has been extremely enthusiastic. it should be made clear that the opening of W59C does not in any way change the operation of W-G-N, which goes right on giving its regular complete service. W59C represents a new and supplementary service. The entire programming of W59C has been arranged with the objective of best demonstrating the full capabilities of FM, Frank. P. Schreiber, manager of W59C as well as of W-G-N, announced yesterday. He added that, so far as he knew, this is the first instance in FM history that this has been done. Musical programs benefit most by FM. Therefore, W59C is laying particular emphasis on music, Schreiber said. Seventy hours of the first week’s 84 hours of programs are to be devoted to music. Not just classical music; not just swing. Every kind of music will be represented. A special FM orchestra, the first of its kind, has been organized to present music thru this new radio medium. The W-G-N Concert orchestra, directed by Henry Weber, and the W-G-N Dance orchestra, led by Robert Trendier, will be heard. So will Ralph Ginsburgh’s Concert orchestra from the Palmer House. The popular Chicagoland hour, with Marion Claire and Attillo Baggiore as singing stars, will be aired on W59C. Beginning Saturday, Oct. 4. the Chicago Theater of the Air operetta productions will be carried. There will be piano recitals by Harold Turner and Helen West- brook, and organ music by Len Salvo. There will be special luncheon and dinner concerts daily and a nightly “Dream Ship” of soft relaxing music. Hawaiian and rhumba music will have their’ appointed hours. And from 11 to 12 each night a parade of the best in dance music from ballrooms and night spots will be aired. This hour will not be duplicated on NV-G-N.
A musical appreciation hour has been arranged. There will be concerts of sacred music Sunday. A musical comedy hour is on the schedule. More than 100 “live” programs a week will be carried together with the best recorded music available thru the new high fidelity, vertical cut transcriptions. From the Mutual network will come such features as Alfred Wallenstein’s Sinfonietta, Russell Bennett’s Notebook, and Morton Gould’s orchestra. An outstanding feature of the non-musical portion of the programs will be the broadcast of news every hour dn the hour over W59C. Five minutes of late bulletins will be given in these periods. Besides the short newscasts, several 15 minute news comment programs will be aired. Among these will be commentaries of Fulton Lewis Jr., the Washingtoa D. C., analyst. This map shows the location of both commercial and experimental frequency modulation (FM) stations with the exception of K45LA in Los Angeles. All others completed are in the eastern half of the United States. W59C is licensed for full commercial operation and it goes on the air with one sponsor who will present a nightly full hour s program including news and music. To acquaint new listeners with the astonishing fidelity of FM trans. missions W59C will present dally, broadcasts of special sound effects. Special musical effects, not often heard In standard broadcasting, and the sound of pouring beverages into glasses, the clatter of dish washing in the sink, will be brought to lis- realistically-, too realistically! 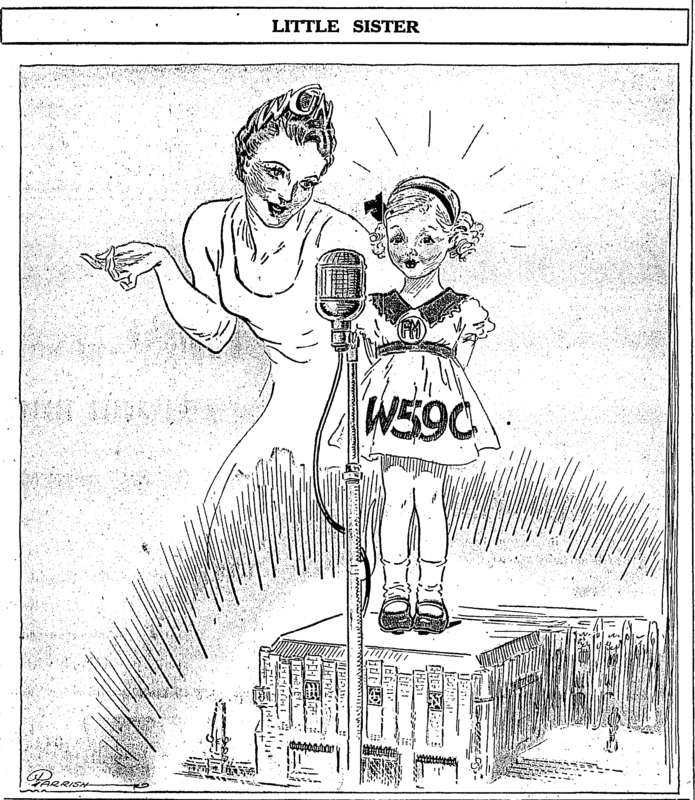 WS9C is established in the W-G-N studio building ‘and in Tribune Tower. For the present the station will operate with a power of 3,000 watts. The transmitter is located on the 29th of Tribune Tower. A 50,000 watt transmitter is on order and is expected by December. The station operates ol a frequency of 45.9 megacycles in the short wave field. When it gets its full sending power W59C expects to give good coverage to the 10,800 square miles—the area within a radius of about i70 miles from Chicago. 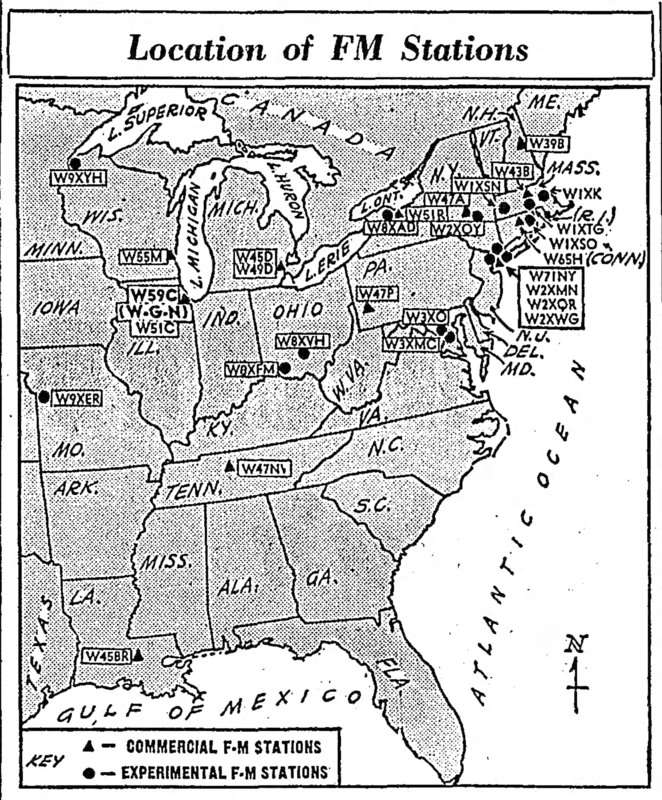 All Chicago stations are to be assigned to identical coverage areas. The range of FM is somewhat limited. A temporary antenna has been installed atop Tribune Tower, reaching upward 28 feet from the floor of the Tower observatory. When W59C goes to high power an antenna system is to be bracketed to the 90 foot flagpole surmounting the tower. This section Is filled with stories. pictures, diagrams that cover aU aspects of frequency modulation. Details of W59C’s programs are given. Explanations of what is required In the way of sets or attachments and how to tune them is included. The list of other FM stations is given and applications of FM in other than broadcasting are outlined. 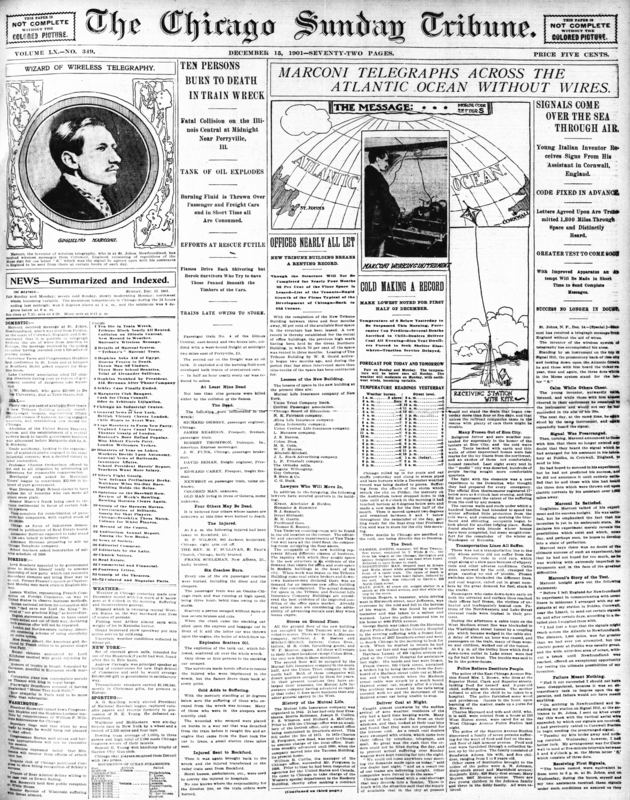 The front page of The Chicago Sunday Tribune for Dec. 15, 1901, showing headlines, story, pictures and map explaining Marconi’s opening of the Atlantic by wireless. 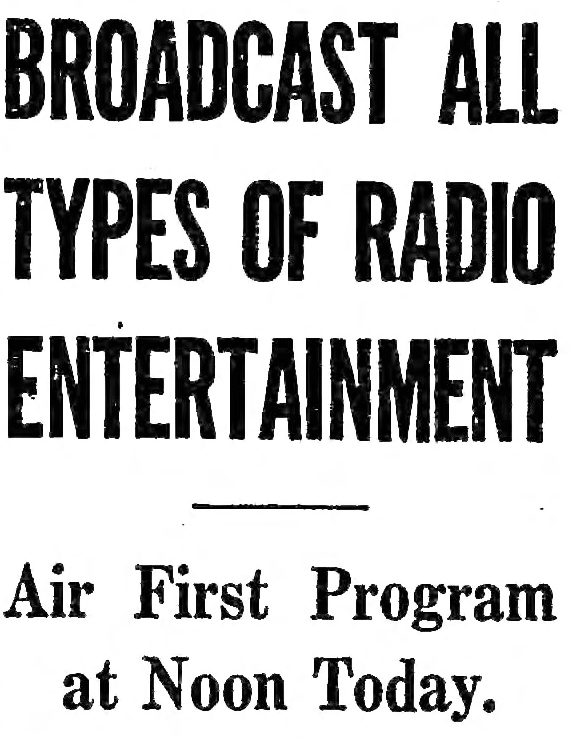 Realizing the great potentialities of Marconi’s system, The Tribune gave five columns more to this story on page 2.